Fiolstræde is one street over from me, and the café itself is right across from the University of Copenhagen's old main library building, now off-limits to the public and housing special collections. 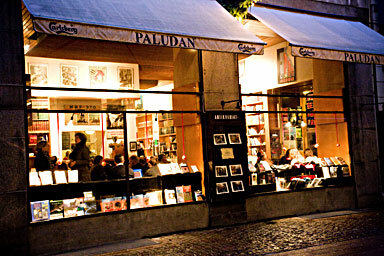 Paludan has been a hang-out for several famous Danish writers since its opening in 1895. They serve brunch, dinner and a few breakfast items, as well as a full array of coffee, tea, alcoholic drinks and smoothies. I can only speak for the lattes and pain au chocolat - both muy bueno... er I mean meget god. The inside is split level, with the bookstore downstairs and the upstairs dedicated to tables for studying, writing and socializing. The walls upstairs are lined with old books, all in Danish, and free to be used (if you can understand them, of course). The floors are original and oh my God, I wish I could pry them up and use them in my own house. Look at the planks! 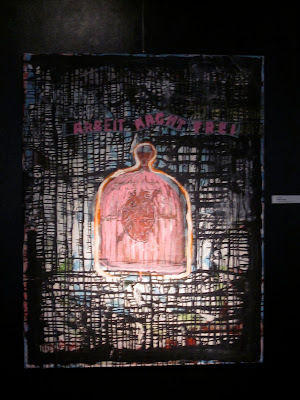 There is also a room that serves as a gallery for local artists. The current display is very modern, and not really my thing, but I did snap a quick shot of my favorite painting. Arbeit macht frei means "Work makes you free" in German, and is often recognized as being the phrase on the gates of Auschwitz. 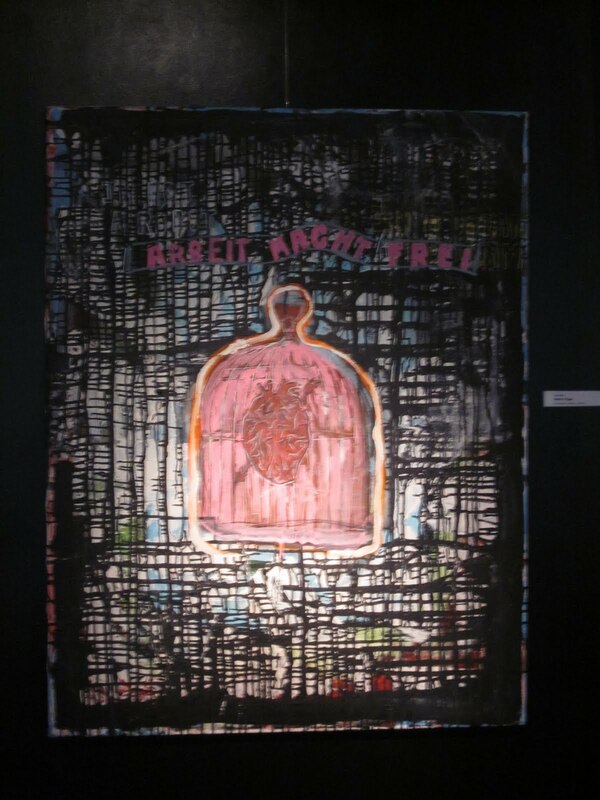 I'm sure the heart in a cage has some deeper meaning blah blah blah, but I just like the colors. Finally, the Paludan is apparently an extremely "Danish" place to hang out. Not only was I spoken to in Danish three times in less than 10 minutes when I first arrived, but I also apparently look so Danish that people assume my language skills extend past hello, thanks, cheers, and Carlsberg. Take, for example, this lovely little exchange between me and the too-chic-to-function Danish woman next to me this morning. Me: "Hej, can I ask you a question?" Me: "What's the password for the Internet?" Lady: "Yes, you know. J-U-L-E-N 2009." Me: "Ah yah yah, mange tak." Too embarrassed to ask again, I put my computer away. Later, I looked up how to spell Christmas in Danish. J-U-L. Huh. Thanks a lot lady. You Mean There's More to Denmark Than CPH?